COGNITIVE HEALTH – Alpha GPC is a natural precursor to acetylcholine, which is used in memory recall and muscle control. 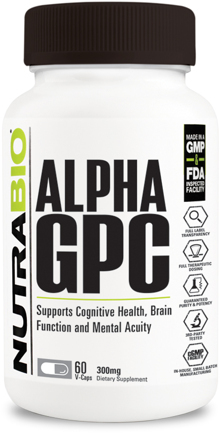 Alpha GPC also offers neuroprotective effects that may aid in age-related cognitive decline. Alpha GPC is also non-stimulatory, meaning no jitters or crash. BOOST POWER OUTPUT – Alpha GPC has been noted to enhance power output in athletes in at least one study. HIGH BIOAVAILABILITY – Alpha GPC is able to cross the blood brain barrier, ensuring maximum effectiveness. SUPERIOR QUALITY - NutraBio uses only the best, and this product is no exception. Our Alpha GPC is gluten free, soy free, vegetarian, third-party tested, non-GMO, and made in the USA. Our manual encapsulation process ensures this product is free of stearates, excipients, and fillers. THIRD PARTY TESTED, FULL DISCLOSURE – Like all NutraBio products, our 5HTP is tested by an independent third party lab to ensure it is both pure and that it meets our strict quality standards. All NutraBio products feature fully transparent labels with no proprietary blends.